We put incredibly powerful devices in our pockets and on our laps daily, but rarely do we see games that utterly embrace this like Infinity Blade has. It’s a showcase piece; a technically and visually gifted game that consistently delivers eye-popping stuff. 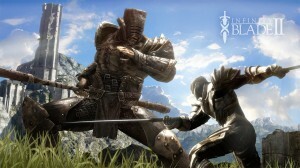 Infinity Blade 2 [$6.99] is a step a step or two beyond what was accomplished in the original, adding in layers and layers of next-level environmental and character texture detail on top of a ton of fantastic ambient touches — sharper shadows, stronger lighting, and a glut of atmospheric effects bolster what’s already a visual delight, especially on iPad 2 and iPhone 4S. In the game’s opening, you’ll be whisked to a Japanese garden where pink petals tenderly fall into a pond filled with koi. Later, you’ll find a fountain with gurgling water creeping over two titanic figures, a crypt filled with gigantic, ragged rocks with glowing glyphs imbued into them, and you’ll even observe plenty of nature again, as the game’s new fortress has plenty of aerial life and environmental effects to share. The added oomph of the presentation is a convenient parallel to what’s going on under the hood. Design-wise, this is more Infinity Blade, except expanded. 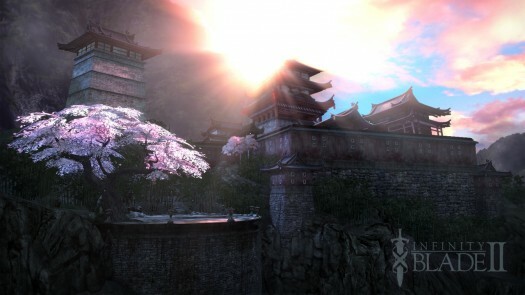 Beautiful vistas and artfully designed and detailed hallways compose that game’s more expansive fortress; the “guided" walking scenes are always punctuated with many more items to loot and fights to be had against increasingly bigger and more complex opponents; also, the mystery as to who you are and why you’re undying is unraveled more coherently, as the writing is now presented with confidence — it actually wants to tell you a good story. The story element in particular makes Infinity Blade 2 a more cohesive game. As in the first, you’ll be once again stuck in a cyclical play loop, forever walking the halls of this new fortress as you puzzle out what it has to offer. But now the protagonist is as aware of his plight as you are, and you’ll be doing things in this new place with this knowledge in tow. There’s a sense of momentum and honest-to-Crom progression since not every re-birth is a simple game “reset;" plus, not just battle death triggers these this time around. Combat has been expanded, too, and its constituent parts tweaked. Dodging, for example, is now monitored by an endurance bar. Dodge too many times in succession, and you’ll take tick damage from narrowly avoided blows. Parries seem much more accurate, now, as well, and are much more encouraged by virtue of the dodge nerf. Oh! And say “hi" to weapon gems. In most cases, they act as weapon modifiers that add elemental damage to attacks. In others cases, they add bonus effects like, say, increased Titan Damage Upon Blocking. Gems can be found or purchased and attached to weapons with matching slots. The game’s currency system is still tied integrally to the combat. Buying new weapons is the key to leveling up, and you’ll need to keep pumping your quarters into the virtual machine in order to compete since each re-birth sees the addition of more powerful enemies. Since you can straight-up buy gold via IAP, this element might turn you off, but in our play, we’ve yet to feel like IAP was anything more than optional. More importantly, dual weapon and heavy weapon wielding have been added to the combat model and they do meaningfully change your combat approach. Two swords eliminates blocking from the equation and rely on your ability to chain together combinations flawlessly. Heavy weapons trade speed for power, but require a sure-hand. I’m not much of a fan of either of these new styles, but they work as they should. The enemies you’ll bludgeon not only look fantastic, but also boast, in most cases, more sophisticated routines and trickier blows to block, dodge, or parry. Just as an example here, let’s talk about the monstrous dog-like thing you’ll meet. It’s heavy and blinded by the spiked cap covering its head, but its sluggish attacks are consistently hard to peg, as it feints with the aplomb of the nimblest creatures. Also, it has vicious quick-time-y attack where it attempts to swallow your dude whole. In order to stop this, you’ll need to tap frantically to keep his vice-like maw from impaling your meaty bits. Sometimes I’m tempted to see what’ll happen if I let it take my dude, simply because of how awesome Infinity Blade 2 looks. Does your guy’s head and torso explode into a plume of blood and bone? 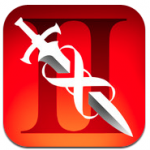 Probably not (for a variety of reasons), but what I’m absolutely certain of is that Infinity Blade 2 is awesome. It’s a consistently well put together visual feast that shows off what Unreal 3, and now your new devices, can do. And it’s great that the core gameplay structure and action model still deliver. 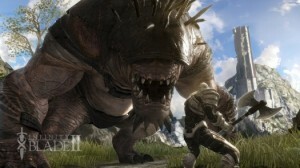 Basically everything that Infinity Blade does has been expanded on for Infinity Blade 2. There’s so much more to do — so much more to explore and see and learn as you hack-and-slash like a champ through a winding and much more complex environment. Straight-up, it’s a great game. As a side-bar here, while nothing is confirmed, the UI elements and Chair’s track record with the original hint at many updates to come including a cool social twist to battle. We’ll be keeping our thumbs and fingers at the ready for some time.